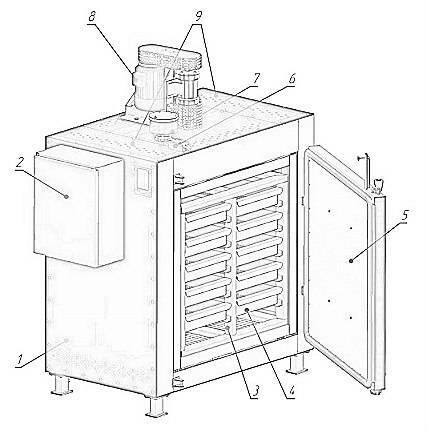 This system can be used by facilities which use zeolites for deep dehydration of transformer oil. Such dehydration requires sorbents with granule size of at least 1 mm. 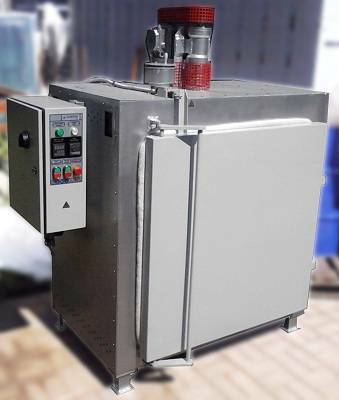 The system can also be used in other fields: any application which requires heating, tempering, baking of materials or parts. Specifications and general principle of operation The cabinet is a welded frame covered by metal sheets, the metal being Steel3. TGhe unit is supplied with mesh pans and a frame to install them. A vent is installed in the chamber to remove gas products of thermal treatment. The cabinet is heated by electric tube heaters installed in the side air conduits of the chamber. Max heating temperature is 400oC. The unit is equipped with circulation fan, which allows uniform distribution of heat across all sorbent layers. Air intake is in the upper part of the unit, from there the air goes to the grate in the bottom of the chamber (upward motion). An automatic temperature control system adjustable from the control panel maintains temperature within ± 9 degrees. A timer allows heating and tempering for a set duration. for better insulation, the gap between the door and the chamber’s front side is sealed with a bazalt cord. The unit connects to AC grid, 380V, 50 Hz by a 5*10 or 4*10 PE cable. The heaters are protected from short circuit currents by an automatic breaker. Th eunit is controlled from the control panel located on the side of the device.